One of my favorite things to do in the summer is blow bubbles with my kids. After learning that our new puppy destroyed all of our bubble wands, we decided to make our own handmade wands this year. They were very easy to make, cost just pennies and provided my children with a full day of Summer fun. Put down a piece of butcher paper and allow your children to use their imagination while decorating the wands. My kids sat outside painting for over three hours this afternoon! After the kids are done decorating the dowels, twist a piece of the wire around the tip for your children. Let them dip their wands into homemade bubble juice for hours of fun! Let settle for 3-4 hours. I am a member of the Collective Bias™ Social Fabric® Community. I am a campaign lead for the Elmer's campaign, however not compensated for this specific blog post with Collective Bias™ and Elmer’s #CBias #SocialFabric This post was just done for fun! I have always been intimated about grilling pizza. We tried grilling it once before, and within a few minutes it was a black mess. Inspired by our recent trip to Hawaii, I was determined to make an awesome grilled pineapple pizza. First I cut a fresh pineapple for the pizza. Next I rolled out the dough, and put it onto a air baking pan. I preheated the oven to 450 degrees. Brushed the dough with olive oil and sprinkled fresh garlic onto it. Then I baked the dough in the oven for 10 minutes at 450 degrees. Once I removed the partially cooked dough from the oven, it was time to add the toppings. I topped the pizza with fresh pineapple, ham and mozzarella cheese. I put the pizza on the grill over low heat for about 10-12 minutes ~ while checking it frequently. We served the pizza with a fresh spinach and avocado salad with cilantro dressing! The only thing I would have done differently was grilling the pineapple first. It would have given it more of a musky flavoring! 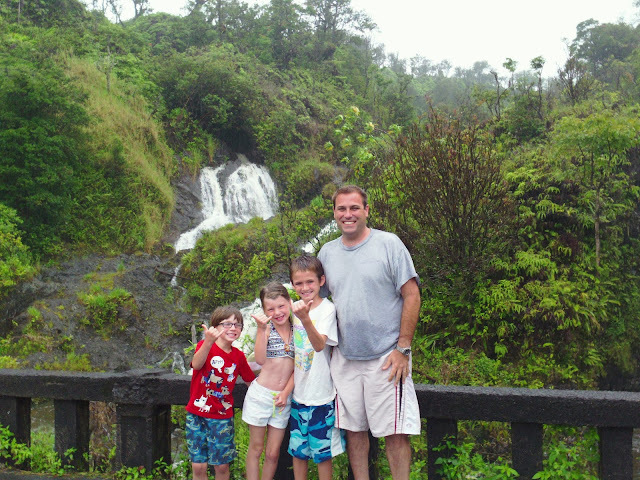 The road to Hana was an extreme adventure for my family while vacationing last week in Hawaii. As we started to drive around to the other side of the island, the rain started. Our family loves an adventure, and an adventure was exactly what we got on our full-day drive. 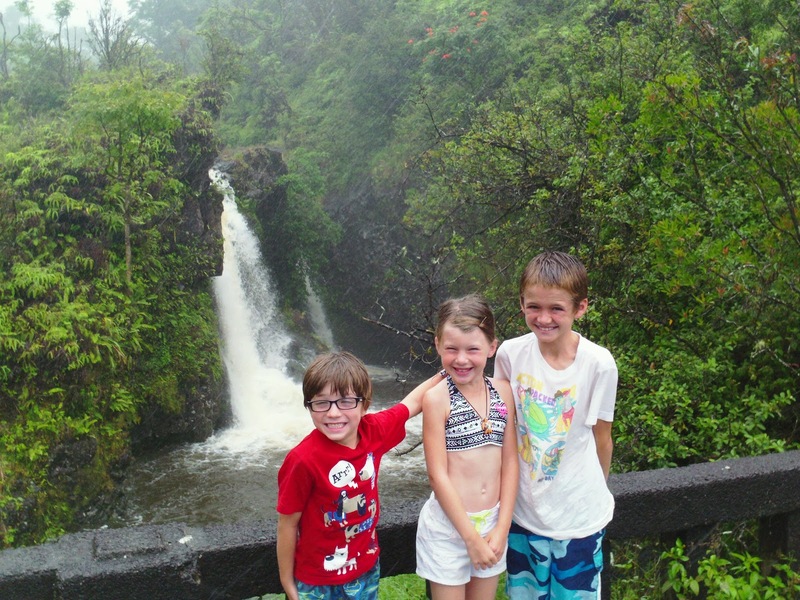 Our first stop was to find the famous Twin Falls. It was sprinkling while hiking down to the falls. When we first saw the falls, they reminded me of the movie "The Goonies" where the kids all went sliding down a muddy waterfall. We were all captivated by its beauty. 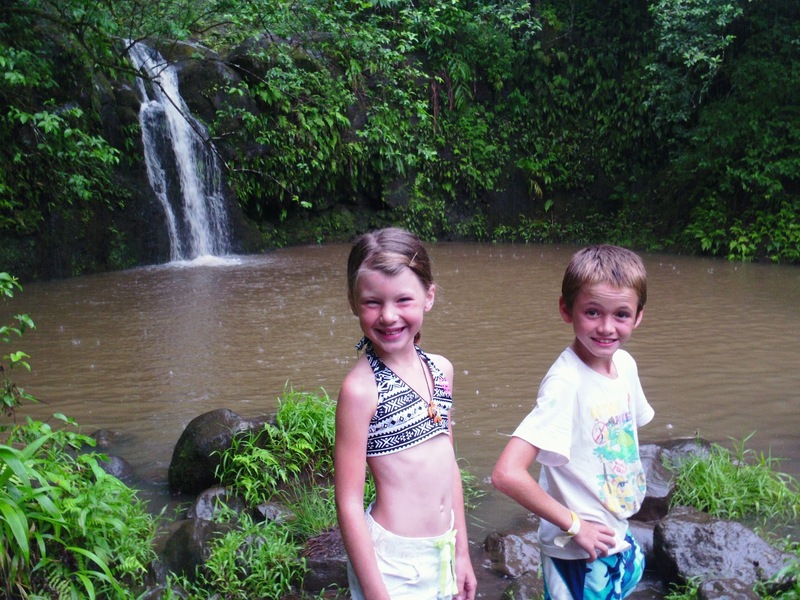 We stopped at many waterfalls along the road, and thank goodness for our cool waterproof camera. Look what troopers we had showing some Hawaiian pride. I had read in an online guide about a secret trail to a secluded waterfall. There was a funny shaped rock that marked the start of this secret trail, as we began our hike. We spent quite a lot of time here, even enjoying our packed picnic lunch. The beauty of this special waterfall brought us closer to nature, closer to each other and closer to God. 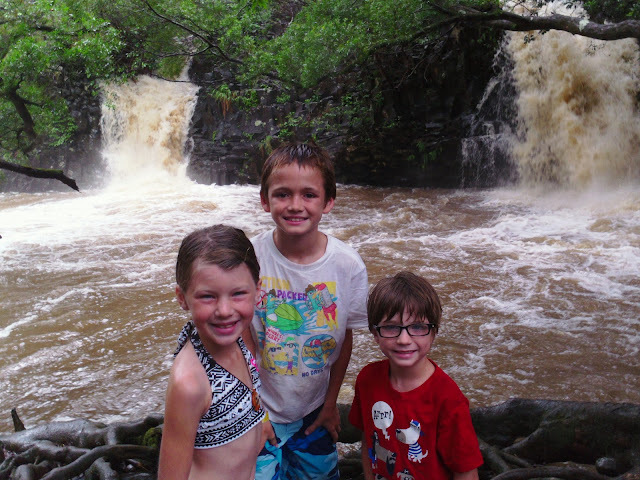 After our time at our favorite waterfall, we hiked a six mile trail around the rain forest. Andrew and I even drank rain water off of leaves - which we were probably lucky we did not catch a parasite from. 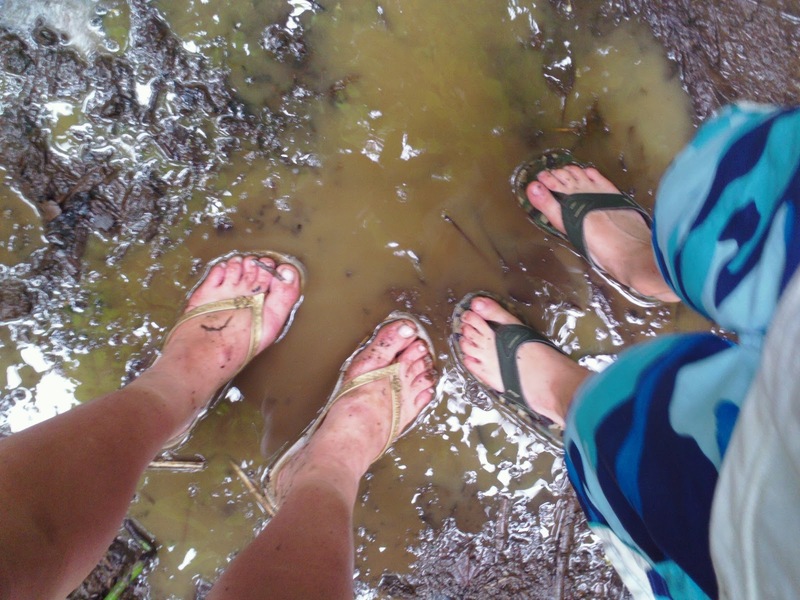 What we learned on our adventures: Don't be afraid to get off the main path in life. Life is adventure - so LIVE it! 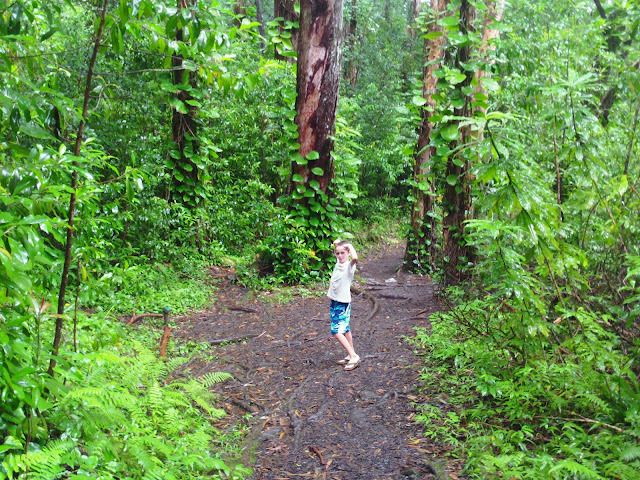 Although we did not make it to the end of the road to Hana, we made it throughout the jungles that surround the roads to Hana. It was the first time my kids had seen a pay phone! They were fascinated by it, and it kept them entertained while we enjoyed a break from our hiking. The morning before we left for Hawaii, Tyler and his daddy went to the El Captian to prescreen the movie Brave. Tyler had been so excited about seeing the film because of the trailers showing horse riding and archery. He talked about getting to see the movie Brave for weeks leading up to the screening. Getting to see a movie at the El Capitan is a nostalgic experience, bringing guests into a different era of Hollywood. Before the boys made it to Hollywood, they stopped for some breakfast at Starbucks. You can see how excited Tyler was about getting to spend time alone with his daddy for the morning. After the movie there was an interactive event happening across the street in celebration of the upcoming film. Tyler got a chance to feel like he was right inside the movie just shortly after watching it. He first started out with the Caber Toss. The Caber Toss is a traditional event in Scotland's Highland Games. The Caber Toss naturally involves tossing cabers. Sounds simple right? A caber, by the way, is a tree - or log that is over 19 feet tall and weighs 175 pounds. Maybe not as simple as it looks! Next he did the Sheaf Toss. This is another traditional Scottish sport in which a pitchfork is used to hurl a burlap bag. The bag is stuffed with straw, and weighs about 16 pounds. The last sport that Tyler did was the archery. This was like a dream come true for him. He was able to showcase his strength, aim and multitasking. I think that he found his new favorite sport! Our entire family gave the movie two thumbs up! It was a great movie for the entire family to enjoy during the summer. The movie opened in theaters yesterday! Disclosure: We were provided with movie tickets for review purposes only. 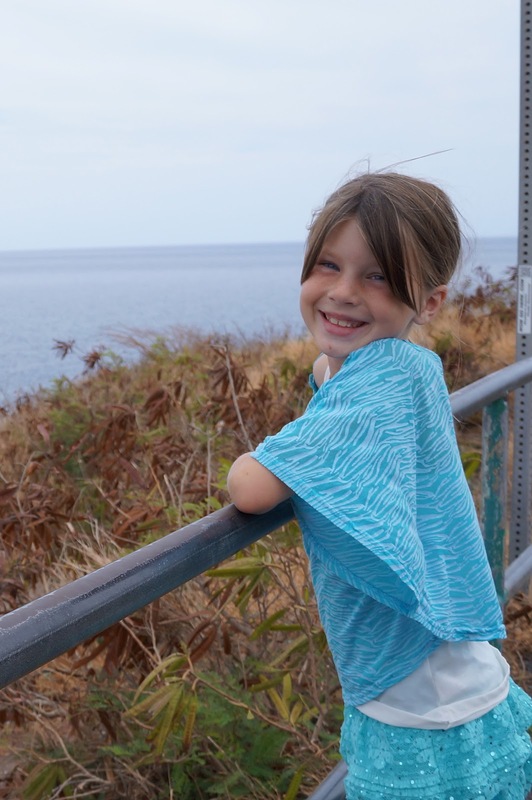 We are enjoying our time this week in Hawaii. Yesterday we were diving off the coast of Lanai when we got a beautiful show from this friendly pod of dolphins. On Father's Day, we got up early and jumped on a plane to Maui. We were eager to enjoy some quality family and relaxation time. When we first got on the plane, I was all prepared to work throughout the entire flight. Once we got on the flight, I quickly learned that there was no wifi over the Pacific Ocean. I was really stressed about all the work I planned to do during the flight, but then I realized that maybe it was a sign that I need to relax and take a break. I did something that I have not done in years - read a magazine, played cards and even took a couple of cat naps. When we got off the plane, we did what we love to do - explore! We stopped at various scenic outlooks, and just enjoyed the beauty that surrounded us. The kids shopped from locals selling souvenirs out of mini vans, bringing home keepsakes they will treasure for years to come. 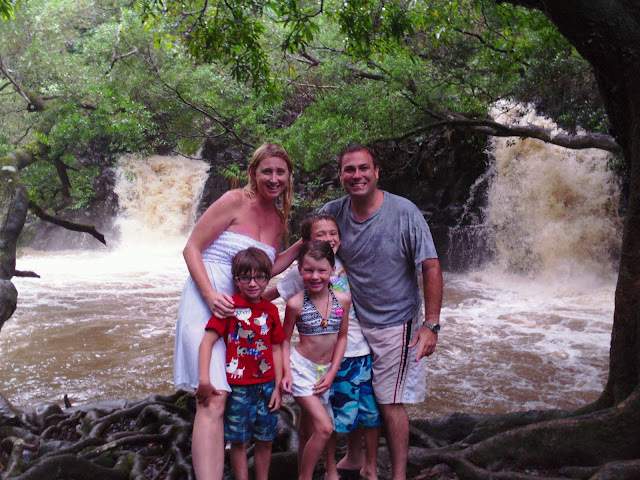 Father's Day kicked off a week full of adventures together in Paradise. School is out, or will be very soon, and there’s a smile on every child’s face as they likely anticipate a summer of fun and freedom. However, as a parent, do you find yourself wondering if there’s something you should be doing so that your child doesn’t fall behind? Statistics show that children can loose an average of 2.6 months worth of knowledge over an average summer. This is why bridge learning is important. Bridging regular curriculum during the school year, with fun experiences over the summer months keeps your child on track academically and just might foster a new motivation to learn more! There are many different opportunities parents can utilize to assure that their children continue to learn over the summer months, and I’m not talking about continued academic classes! Let your children feel like they are still on that well-deserved summer vacation, and web the skills they practice in school (math, science, reading) into a “cool” summer project of their choosing. Talk to them about what they are interested in and find their current passion. Suggest ideas for a fun project that will foster their passion and help them learn more about it. This is the simplest and most effective way to assure that your child will stay challenged and stimulated when out of the classroom. For example, if you’re at Pretend City and your child walks into the grocery store, do they say that they’d like to buy the store and run it themselves? That deserves some research and imaginative thinking about how to get the money to buy it and what to do to make it profitable. Or maybe they are passionate about cartooning. Could they imagine some unique characters and experiment with colors and interesting stories to create their own superhero comic book? Listen to your child and work with them to build on their own interests. Have they always wanted a vegetable garden or tree house in the backyard? Does your child’s interest in space mean they’d have fun building a model rocket ship? Help them pick a project they can tackle all summer long and be willing to lend some support. They’ll have a blast reading books or going online to do research, and experimenting and engineering solutions. And once the summer is over they’ll have a completed project that they have learned a great deal from and can take pride in. The beauty of a child taking on their own project is that it is child-driven, which is completely self-motivating. By its own nature, it’s going to be an interesting learning experience for your child as he or she wonders, experiments, designs, engineers and accomplishes. There’s a lot of emphasis on the importance of STEM learning right now. Consider that when a child takes on their own project, they are actively engaging in the scientific process! They’re observing, hypothesizing, risking, experimenting and adjusting their hypothesis along the way to find the answers and reach their end goal. It’s not necessarily learning a subject, but they’ll develop and use STEM-related learning throughout the process of completing their project, and that is much more valuable. This is bridge learning at its best. 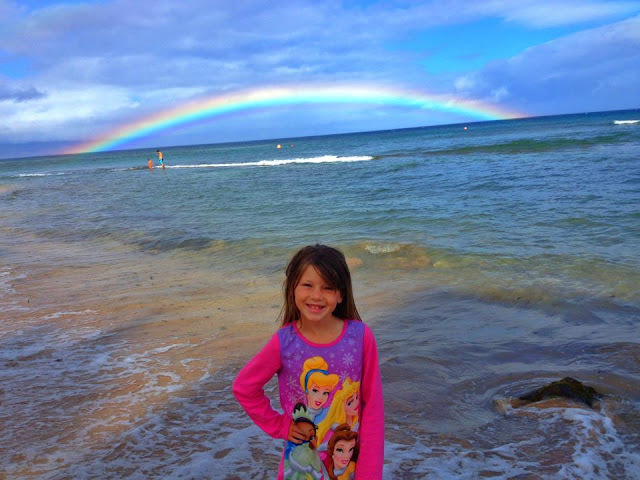 Important learning that can easily and naturally happen over the summer with your child. Try it and watch your child blossom! You may just learn a thing or two in the process as well. Linda earned her Bachelor of Arts Degree in Human Development and Master's Degree in Marriage, Family, and Child Therapy from the prestigious Pacific Oaks College in Pasadena. Linda joined Pretend City in 2002 prior to its opening and has over 40 years of experience working with children and families in both the fields of early childhood education and family therapy. I have never had a vegan cupcake that tasted better than a traditional cupcake until now. Last week while at the Farmer's Market, I purchased an "allergy-friendly" vegan cupcake mix from a local vendor. I will be honest that I was pretty nervous about trying the mix, but after trying my first cupcake - I was sold! I spent quite a lot of time talking with the owner of Dulcitas about how their products are made. My older son has food allergies, and he is always more sensitive to baked goods. They are all made using high-quality organic products with no artificial flavors or preservatives. The cupcakes were super easy to make. I just added water, oil and vinegar - viola! I can't wait to go back next weekend for more mixes! Guess What? Children are already on Facebook!